I have an affinity for Greek food. Maybe not gyros, but falafel and Greek salads are totally up my alley. I’ve had some orzo pasta sitting around for awhile since I bought it a while ago to add to some soup. 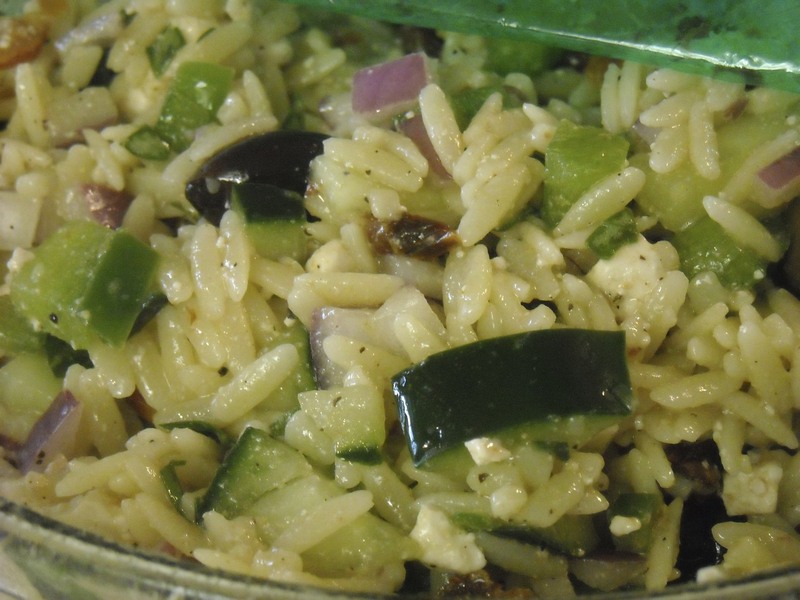 Orzo is a rice-shaped pasta that some people use in place of a arborio for risotto. 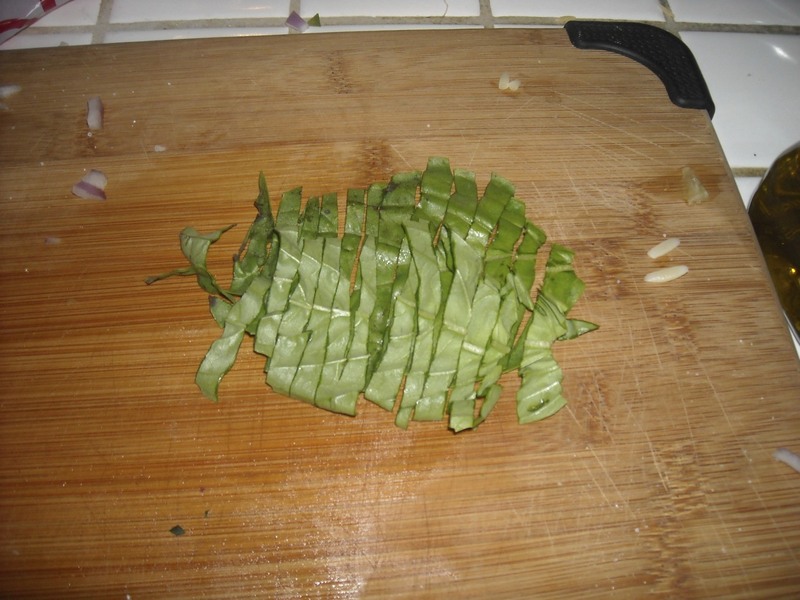 It also makes a great addition to soups for rice or long noodles. I love orzo. It’s great cold, too. 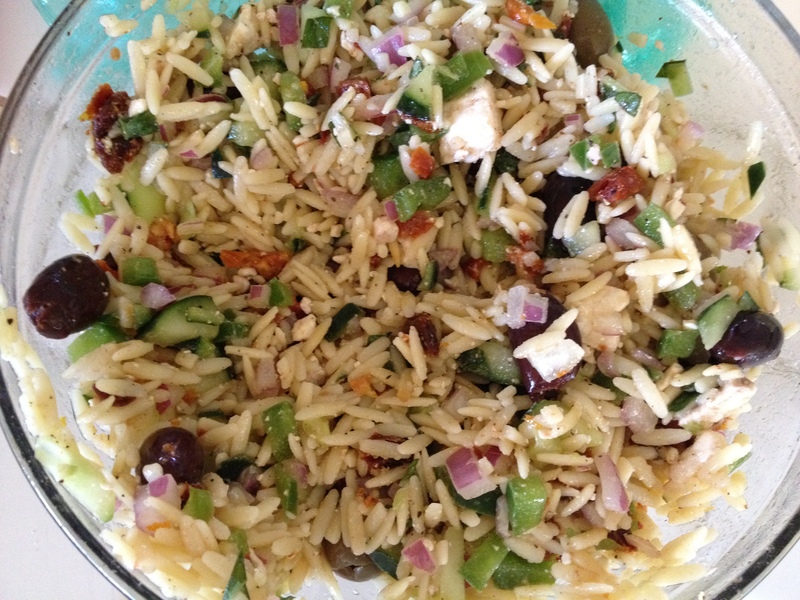 In an attempt to use up some ingredients I had on hand, I made this orzo salad that’s surprisingly full of flavor, hearty and heavy on the Greek influence. 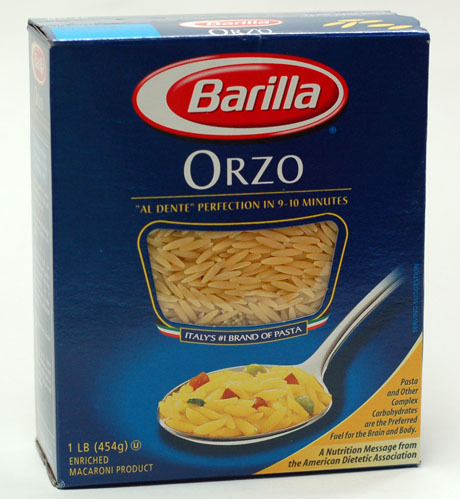 Cook the orzo according to package directions (in salted water!) and rinse thoroughly with cold water when you strain it. 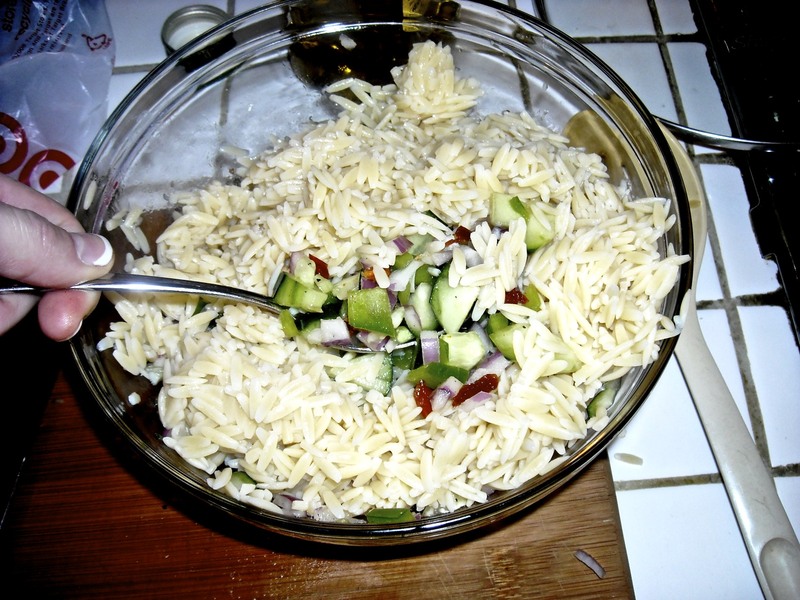 In a big mixing bowl, combine the cucumber, sun-dried tomatoes, bellpepper and onion in a bowl. Salt and pepper them and drizzle with 1 Tbsp. 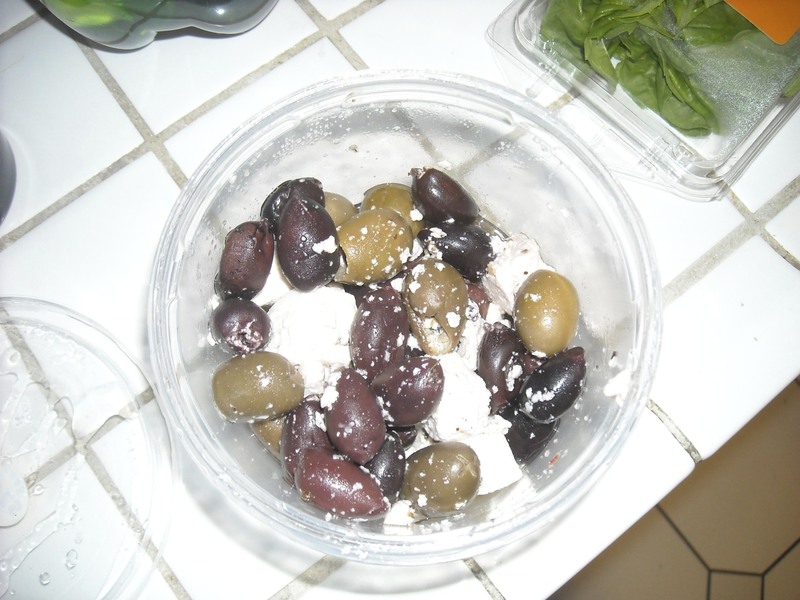 of EVOO and 2 Tbsp. of red wine vinegar. Add the cooked orzo to the mixture and toss to combine. Season again with salt and pepper. Sprinkle in the basil and toss again. Squeeze the half of lemon over the bowl and toss to completely incorporate. Taste again and season accordingly. If it doesn’t have enough tartness to it, add another splash of vinegar or another squeeze of lemon juice. Let sit in the refrigerator overnight or for 2-4 hours before serving. Chickpeas. If I had a can on me, I would have most definitely add them to the salad. They’re great for protein and tasty to boot. Artichoke hearts. These are just yummy and add some depth to the salad. Psst: A near-future Meatless Monday will be another aforementioned Greek food. Get excited! Sundried tomatoes are a favorite of mine–and I really did just use up ingredients I had on hand (hence, the half of cucumber.) So glad you enjoyed it!